Nexon Company Has Released Elsword M Shadow Of Luna On Google Play Store But Currently Only Available In Few Countries – Singapore, Thailand, And Vietnam. Soon Will Available For All. Unreleased Version[APK] Is Still Available On Some Websites To Download[Non-English]. Update – I’ve Added The Download Link Of Elsword M Shadow[Given Below] – In Case This Game Is Not Available In Your Country. Elsword M Shadow Of Luna – Nexon Company’s This Game Comes With Brilliant Graphics, Awesome Gameplay, And Easy To Use Controls. The Game Utilizes Dynamic Tag System – The Leader Starts The Fight. When Things Get Tough – You Can Call Another Hero For Fight. Elsord, Aisha, Rena & Raven Are The 4 Heroes. 75 New Skills Are Featured – Each Hero Can Equip Four Combat Skills Out Of 75 Available. You Navigate Your Hero By Holding/Dragging On The Left Screen, Right Side Screen Is Responsible For Attack, Perform Special Attacks[Skills]. You Can Customize Your Heroes With Equuippable Skins, Over 300 Skins Can Be Collected And Upgraded. 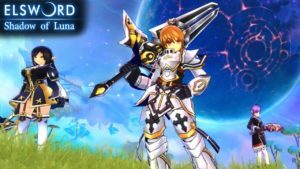 Elsword M Shadow Of Luna Has Multiple Gameplay Modes – Story Of Luna, Tactical Boss Encounter, And Never-Ending Monster Waves. You Will Need A Network Connection To Play[Not Offline]. Make Sure You Must Have 2GB Of Free Storage Space To Download[Because Of Patch], It Requires 2GB Of RAM[Minimum], Android OS 4.4.4 And 1GHz Quad-Core Processor. Elsword M Shadow Of Luna Is Currently Available In Few Countries, Soon Available To All.